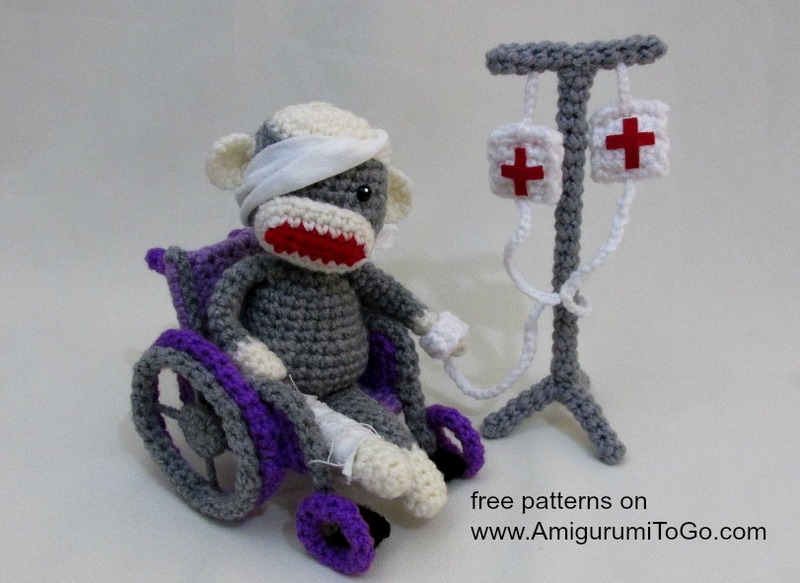 Special notes: This monkey is designed to fit in a wheelchair, a pattern soon to be released so to keep the monkey at the size needed use the hook size and yarn weight that is given in the supplies list. This pattern includes instructions for adding in the red band and also for no red band. *if you feel the neck is floppy then bend a couple of pipe cleaners in half and then in half again and push that inside the neck. Add a dab of fabric glue to the part that sits inside the neck to keep it from sliding up or down. *stuff body, stuff lots and fill out the belly. Also make sure to stuff around the pipe cleaner and make sure the pipe cleaner stays in the middle of the stuffing. 5) *you will use only 4 stitches of this row. 1sc in the next 3st then sl st next st and f/o leaving a long tail for sewing. Place the muzzle over the face and sew it flat. Sew the top edge of the muzzle just under the 10th row. When sewing around do not pull the stitches so tight that you alter the shape of the muzzle. View the video for the best sewing results. *For the limbs and tail you can add in a red band which means more color changes for each part. This can be difficult for the beginner so I've included instructions for each option with or without the red band. *stuff hand, do not stuff arm. Put in a pipe cleaner if you want the arm to be poseable. Fold one in half, make a loop for the end that will sit inside the hand and bend over the other ends so there are no sharp points. Make the length just a bit shorter than the arm. *stuff foot, do not stuff leg. Put in a pipe cleaner if you want the leg to be poseable. Fold one in half, make a loop for the end that will sit inside the foot and bend over the other ends so there are no sharp points. Make the length just a bit shorter than the leg. *do not stuff tail. Put in a pipe cleaner if you want the tail to be poseable. Fold one in half, make a small loop for the end that will sit inside the lighter end of the tail and bend over the other ends so there are no sharp points. Make the length just a bit shorter than the tail. 18-19) squish the top of the tail together and sc through both sides at the same time. 1sc across the top 3 times for 2 rows. f/o and leave a long tail for sewing. 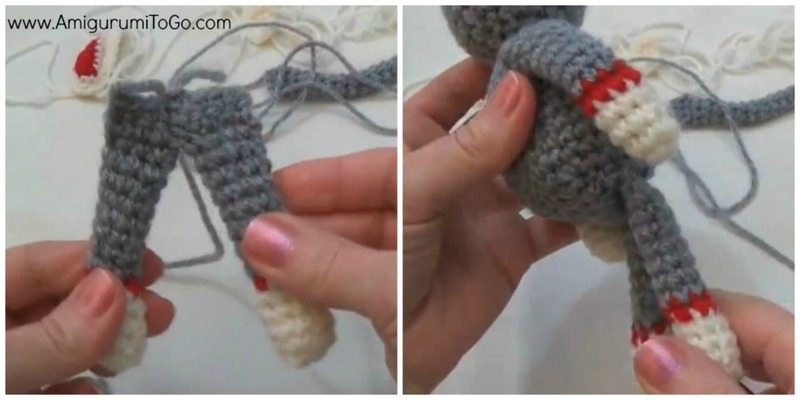 Sew the flat part to the back of the monkey. View the video for the best sewing results. 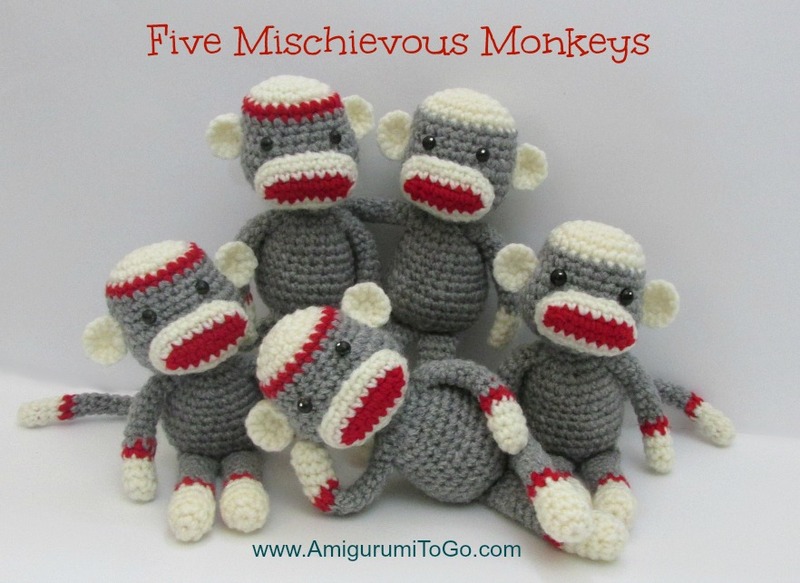 And there you have it, your own sock monkey! You are amazing! You always come up with the pattern I need just in time. My son-in-law feels a bit left out with me crocheting dolls. for daughter and granddaughters According to my daughter he has always always wanted a sock monkey. You are the best. Wow how neat it has been to have found your sites! Thank you so much!. 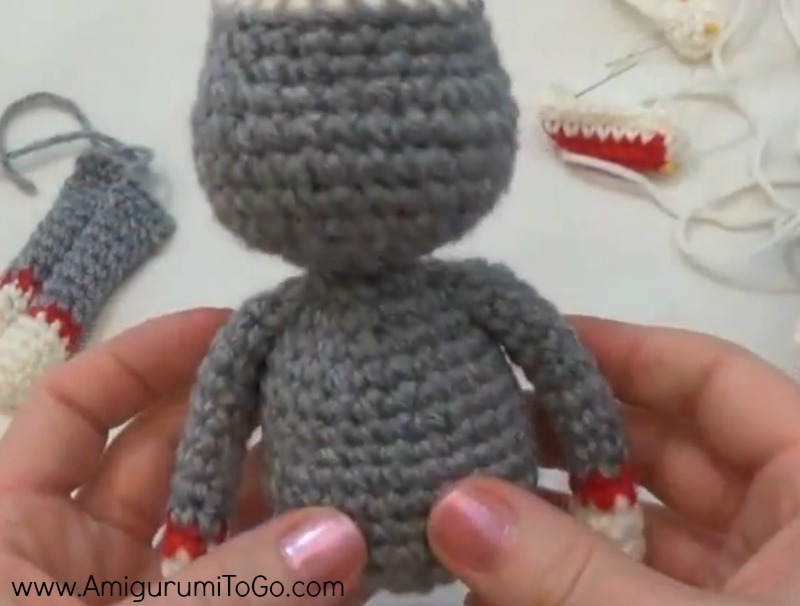 Hi Emily, the sock monkey I designed for the chair is about 6 inches tall. And no, you can not use cardboard. You need the holes of the plastic mesh to go through on some parts of the chair. How awesome! I'm so glad you are enjoying the patterns and find the videos helpful, that means a lot to me. Thanks so much for taking the time to comment. 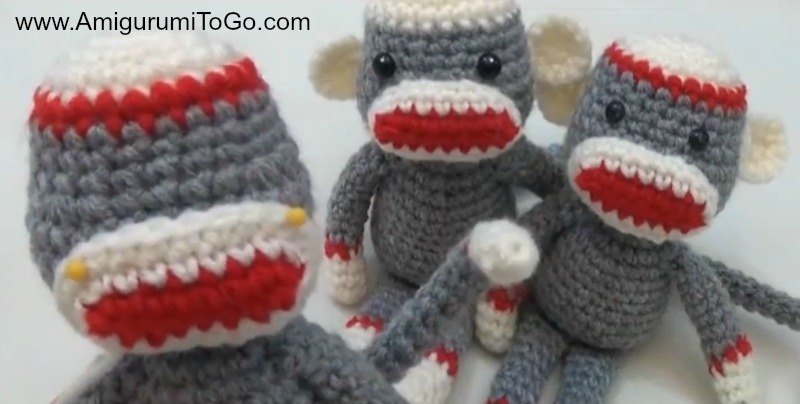 about how tall are these sock monkeys? Thank you for teaching me how to crochet, your tutorials are easy to follow. I am now totally addicted to crocheting and driving my family mental, I started because I needed something to occupy my hands whilst on a diet, I'm now two stone lighter and still crocheting who would have thought it would become an aid to dieting hahaha. . I thought I saw a link to instructions using #10 crochet thread, but am not finding it again. Do u still have them? Thanks! I love your patterns! Thanks for sharing! My husband told one of his friends at work that I would make a sock monkey for him. I never had done one before. Thank you for the pattern! I used an H / 5mm hook to make it a bit larger. Looks good!